The previous GeoCurrents post ended on a controversial note, contending that although the wealthy suburban communities of the San Francisco Bay Area seem decidedly liberal, they actually embrace highly conservative policies at the local level. Before I attempt to validate this claim, a word of warning is in order. The entire issue is muddied by terminological imprecision, and even more so by the simplistic nature of the conventional political spectrum, which in the United States runs from a liberal left to a conservative right. The flaws inherent in such a model are not difficult to locate. Libertarian beliefs are not the only ones that find no space on this political gradient, while “neoliberalism” is in many ways highly conservative, just as “neoconservativism” is some respects more radical than conservative. “Liberalism” itself means different things in different contexts and different places, as does “conservatism.” It is thus no surprise that students in the U.S. are often confused by academic discussions of political positions across the world, having difficulty, for example, understanding how the Australian Liberal Party could form the country’s conservative contingent (the Wikipedia helpfully describes the party’s ideology as one of “conservative liberalism” and “liberal conservatism”). That said, it is generally agreed that certain positions fit comfortably on the left/right gradient. Although environmentalism has certain conservative aspects (as etymologically reflected in an older term, “conservationism”), the movement today is firmly identified with the left. By the same token, concern about global climate change is highly characteristic of the left. In the U.S., the political right tends to be suspicious of the entire phenomenon of global warming. Until recently, such views were largely confined to the far right, as mainstream Republicans tended to support market-oriented approaches to reducing carbon emissions (such as “cap and trade”). Over the past few years, however, almost all self-identified conservative politicians in the United States have come either to view global warming as greatly exaggerated if not an actual hoax, or have simply gone quiet on the issue. As a result, concern about global climate change in the U.S. is now a hallmark of the left (or liberal) side of the political spectrum. Among American liberals, on the other hand, climate change looms large. Often viewed as an existential threat, global warming has come to overshadow all other environmental concerns, at least at the rhetorical level. Unless something is done, and done quickly, to address the problem, we are warned, the consequences will be disastrous. Exactly how rapidly change will occur, and how devastating global warming will be, remains debated, but few on the left doubt that urgent action is required. One of the keys to reducing carbon emissions, environmental scientists have concluded, is urban intensification. Although the American environmental movement initially evinced a strongly anti-urban bias, such attitudes have largely disappeared in the scholarly community. Whether in regard to transportation, heating, or the basic provisioning of goods and services, dense urban environments are vastly more efficient than scattered settlements, and therefore have a much lower carbon footprint on a per person basis. Recent publications that persuasively outline this position include James S. Russell’s The Agile City and a special edition of Scientific American. Population growth bolsters the environmental case for urban intensification. 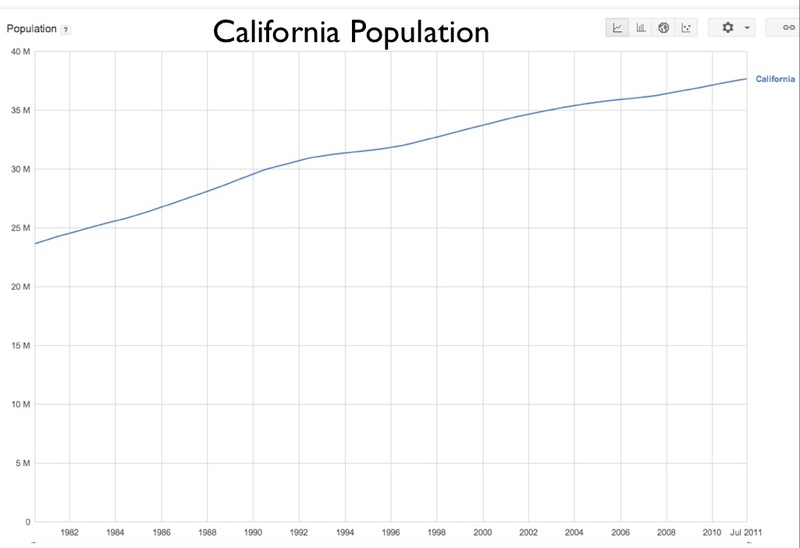 California’s population continues to expand, due largely to immigration, both legal and undocumented. A generation ago, many local environmentalists argued for immigration restrictions, contending that additional human numbers would put too many strains on the state’s—and the nation’s— natural resources and ecosystemic balance. Today, however, such voices have all but disappeared; opposition to immigration has come to be seen as a nativistic, right-wing stance, not one that proper left-leaning environmentalists would embrace. Environmental organizations these days tend to be quiet on the immigration issue. 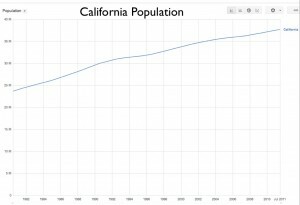 Given that the population of California will continue to expand, the compelling question becomes where to accommodate the state’s new residents. 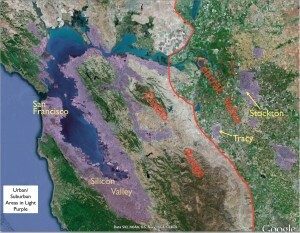 Until the crash of 2008, the chief dynamic was extensive growth, pushing ever outward by way of what James S. Russell calls the “suburban growth machine.” In the Bay Area, that process was reaching its limits; by 2000, the local lowlands had essentially been filled in, while the hills were largely off-limits; as a result, new growth spilled eastward into the Central Valley. 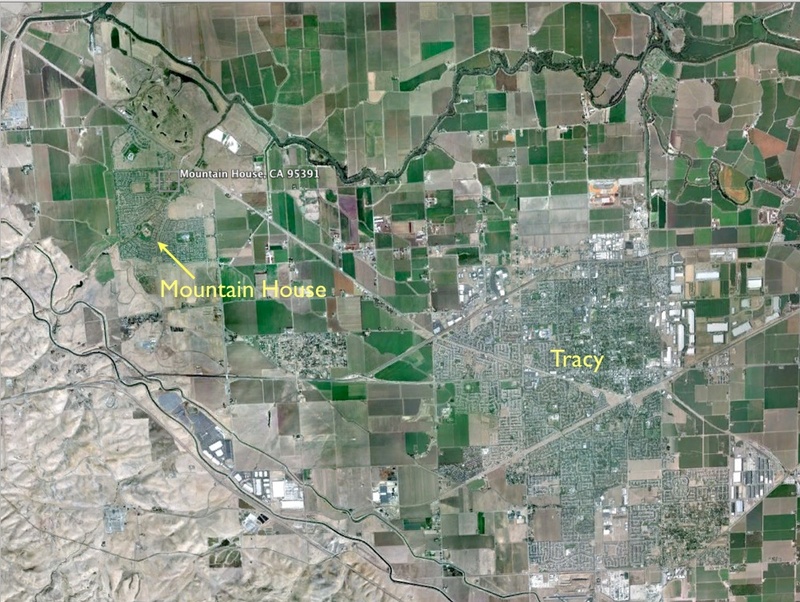 Cities and towns in the valley began to mushroom, with instant suburban communities such as Mountain House sprouting in the fertile farmlands of San Joaquin County. 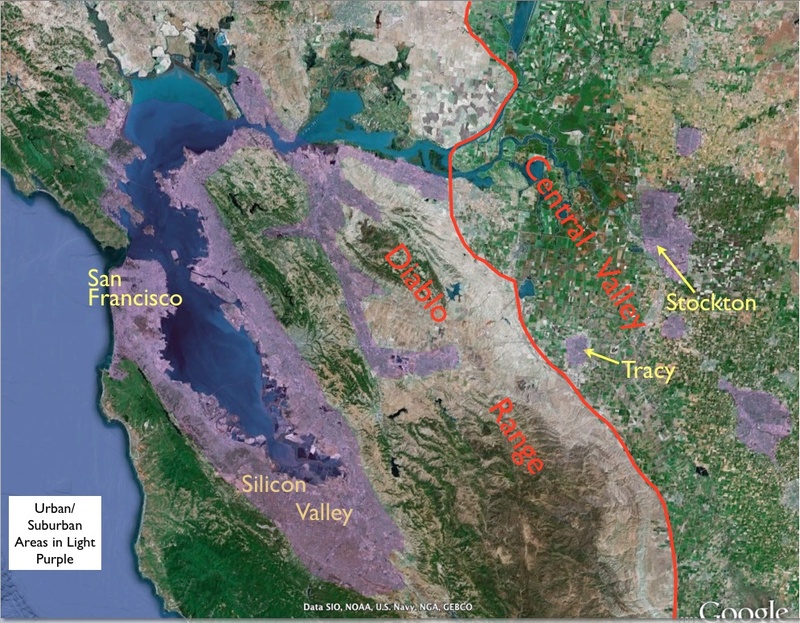 Commuting from these growth zones along clogged freeways across the rugged Diablo Range into the Bay Area was a lengthy ordeal, and when gasoline prices spiked in 2008, a bad situation became much worse. According to some reports, Mountain House now has the highest level of negative housing equity in the country, and the nearby city of Stockton is verging on bankruptcy. 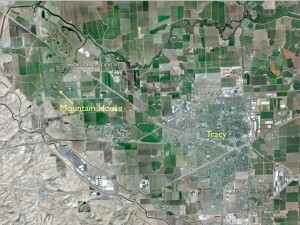 Beyond the far suburban fringe of the Bay Area, the population of the San Joaquin Valley more generally surged in the period leading up to 2008. Most growth here was suburban as well, occurring at the fringes of Merced, Fresno, Visalia, Bakersfield, and other valley towns. Unlike the Bay Area, housing prices here remained within the reach of most families, attracting increasing numbers of newcomers. From an environmentalist perspective, suburban expansion in the valley has taken a significant ecological and economic toll. Some of the most agriculturally productive lands in the country have been paved over, replaced by inherently carbon-intensive, car-dependent sprawl. The population surge in the topographically enclosed Central Valley, moreover, has generated some of the country’s most severe air pollution, threatening the forests of the adjacent Sierra Nevada Mountains. Serious environmental analysts concur in rejecting the suburban “extensification” model that has hitherto characterized California’s demographic expansion. The only real alternative, most would agree, is urban intensification, which entails increasing the population density of existing cities, whether by building condos in empty suburban lots (“infill”) or by constructing high-rise apartments in urban cores and around public transit stations. From the environmentalist perspective, the goal is to reduce the carbon footprint by building housing dense enough so that residents are not dependent on the personal automobile, but can instead get by on rail, bicycle, and foot, with “zip cars” for periodic excursions further afield. The urban intensification model presents an unusual environmentalist formula in that it is not countered by economic logic. On the contrary, in the San Francisco Bay Area, market forces would instantly begin intensifying cities if they were not restrained to a massive extent by local governments and citizen-advocacy groups. Ironically, such organizations fight development in the name of environmental protection, focusing on the preservation of existing neighborhoods and ignoring other scales of analysis. In so doing, they thwart the emergence of less carbon-intensive urban options, and are thus, from a climate-change point of view, inherently anti-environmental. The anti-environmental implications of local property owners’ opposition to urban development is often noted yet seldom taken seriously. The environmental community essentially gives NIMBY (“Not In My Backyard”) activists a pass, largely because they are able to portray their anti-intensification efforts as entailing environmental protection of a different kind. At its very start, the modern eco-movement embraced the credo “Think Globally/Act Locally,” and that is precisely what opponents of enhanced urbanization do. Nowhere are such tendencies more apparent than in Palo Alto, arguably the heart of Silicon Valley, as we shall see in the next post.